Now playing... Dragon Warrior 3! Yay NES games! Portal 2 is pretty great. Just picked up Empire:Total War today. I think I owned it once before, but couldn't get into it. Maybe I'm bored enough now! Just finished playing the original Alan Wake, and downloaded the sequel, American Nightmare today. Finally finished Skyrim's main quest. 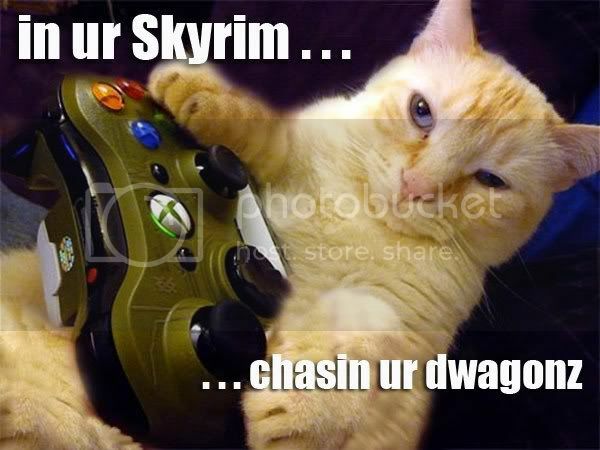 Finished my 2nd play through of Skyrim a couple minutes ago. This one took about 139 hours, a few less than the first go around. Oh, the days when I had time to play video games. Anyone else planning on getting Risen 2: Dark Waters in May? I've been following it for about a year, and have noticed quite a bit of advertising for it lately... it's a Pirate RPG... they'd have to try really hard to mess it up! I'm hoping that in the next patch for the X Box, they let us weaponize everything. I would love to defeat a dragon using nothing but cheese. I've been playing Star Wars: The Old Republic pretty frequently lately, I was in beta and early access. I have 1 level 50 Jedi Knight and several alts under level 20. Proof that Benny Hinn is dragonborn? Skyrim I like to pretend that I'm Orthodox Rambo slaying crusaders and Ottomens, liberating Constantinople, saving Orthodox women and looking stylish the entire time with my awesome Dwarven helmet and legendary Nord Greatsword. I think that developers will do what EA did. If you buy a used copy, to play online, you have to purchase the online pass (like Battlefield 3). If true, it will sadly be that time to write Sony off completely. There was a period- around 2005- when I thought Sony could do no wrong. They've spent the last 7 years doing their level best to prove how mistaken I was. I learned in 2005 how terrible Sony was... They destroyed one of the best games ever... But today Bioware has surpassed SWG with SWTOR and I'm enjoying TOR far more than I did SWG. Even with some idiots hating on it. If this is true, I will never buy a PS4, and it's a shame. I really was thinking about doing so when they eventually release it. The no backwards compatibility thing doesn't tick me off as much (though I am angry about that, too) as the no used games thing. Seriously. It is possible that what will actually happen is Sony will make it impossible for the PS4 to read previous play station games, and then they will create a marketplace where previous PlayStation games can be downloaded, splitting the profit between themselves and the developers. Yeah, they're doing that now so I'd imagine they'd rocket up that because they're making tons of cash on games like Final Fantasy Legends, Shadow of the Colossus, etc. What primarily irks me (especially as someone who is working toward a degree in game design) is the mindset that the developer is somehow owed for each and every time a game changes hands- as if they are "losing money" because someone decided to pick up a game for $5 that happens to be previously owned. Let's take this approach to any other form of intellectual property- imagine Stephen King (or, more likely, his publisher) doing everything possible to shut down used book stores or Marvel Comics doing their level best to drive comic books stores (who mainly exist for back-issues) out of business and complaining that they don't see any profit off that copy of Amazing Fantasy #15 that sold for $1 million, or a traditional artist complaining that after selling his painting to a collector for $5,000 he didn't see any money from that same collector reselling the artwork to someone else. On the one hand game developers complain about piracy hurting their profits, then on the other they have an overblown sense of entitlement when it comes to their IP. By all means, code classic games for your new system- the life span of cartridges and disks is limited by how well the original owner takes care of them, and there will always be demand for Super Mario Bros 3 and Final Fantasy VII that cannot be met by the used game market because of that (though SMB3 would need to be bought new unless you wish to shell out cash for a pristine NES)- but that's no reason to not make your system backwards compatible. Backwards compatibility encourages customer loyalty- if I can play my game library on the new system I am more likely to buy the new system and buy new games for that new system. If I can't play my old game library on your new system then I have no incentive to prefer your brand over your competitor's- if I'm just going to have another system taking up space on my home entertainment center why should I not prefer the new X-box or Wii-U over the PS4 and keep my PS3 alongside your competitor's system? Why should I prefer to buy your system AND have to rebuy my game library to play them on your system? I just started playing "Catherine," a really weird Japanese mystery. So, since the new Playstation is coming out, I bet that the companies like Microsoft and Nintendo are also going to release their next console soon to compete. I'm curious about what the next generation xbox 360 is going to be like. As well as a consumer backlash, Pachter indicated that GameStop--who he sees as the biggest potential loser in this scenario--would simply refuse to carry the console. This refusal would naturally hurt sales of the platform, he said. In a battle between GameStop and the consoles, I see the store as being on the losing side- they are fast losing good will and reputation in the gaming community and their biggest competitors in the used games market, Best Buy and Amazon, are too big to fight. GameStop consistently over-prices their used games, if the choice is between a five dollar difference new and used, I'd take the new. Really, the only reason I've ever gone to GameStop is that they are usually easier to get to- they fit conveniently in small shopping centers and thus are everywhere, while other places that sell video games are big box retailers and are usually a 15-20 minute drive. I hope the game industry crashes. I played SWTOR during beta and early release, but as of last month I really haven't had anyone to play with and lost interest in gaming for a while, so I canceled my subscription. It was a really great game so I might get back into it. Elephant Quest! It's a cute little game on Kongregate. I'm an X Box-atarian myself, but I thought people might like to know about the Playstation stuff. Just saw this on the CNN site. I have an X-container myself, but I sure do miss the Zelda games from Nintendo. Back when Final Fantasy XIII came out, I traded in my copy of Tales of Vesperia to get help pay for it. One of the worst gaming mistakes I've ever made. Yesterday, I corrected this mistake. And I also bought Swat Kats: Radical Squadron for the SNES. Never played it before, but Swat Kats was one of my favorite shows growing up. FF XIII is a horrible game. A beautiful, horrible game. I didn't feel like I had the same freedom in FFXIII like in previous ones. First of all, I agree with primuspilus about FFXIII. As for you Aindriú, I believe at least some of that can be accounted for by how linear the game was. I miss the days of FFIV and VI, personally, though I did like FFXII. Anyone here play Kingdoms of Amalur: Reckoning? I can't tell whether to get it or not. There seems to be disagreements among the reviews I've watched on youtube. For example, the gamespot reviewer says the open world is fairly generic, while the IGN reviewer said it was great; the gamespot reviewer talked about the story/quests as though they were repetitive, while the IGN reviewer talked as if they were great; etc. Which is it? All the reviews I've seen say that the battles are terrific, but the thing is, I don't like that more action oriented style of combat that it seems to have.